Infrae’s core business is creating software. This activity extends far beyond writing code. Applications are deployed in an environment, with other software, other systems, and people. 0ur service focuses on nurturing and maintaining a healthy ecology within an organization. There was a ground-breaking book published in the 90’s, called “Crossing the Chasm: Marketing and Selling High-Tech Products to Mainstream Customers”, by Geoffrey A. Moore. In it he talks about the concept of the ‘whole product’, where there is often a gap between the product delivered to the customer and the original marketing promise made to that customer. 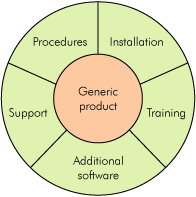 The generic product is what is actually delivered while – in order to effectively use the product – the customer needs all sorts of augmentation, including additional software, installation instructions, support and training, advice, etc. Infrae’s approach is an update of Moore’s ideas that takes an open source business model into account. Moore talks about giving the customer a compelling reason to ‘buy’, whereas we offer a compelling reason to ‘use’. 0ur freely downloadable software is available as a whole product, augmented by offerings for any other need an organization may have. Infrae has extensive experience integrating in existing, complex, technical environments. Integration is eased by our zealous focus on standards and protocols. The high quality of Infrae’s products can be traced to one aspect: we talk – and listen – to our users. This interaction frequently occurs when we provide support. In some cases a customer’s requirements dictate customization, in order to satisfy a specific need. Software products are useless without documentation. Infrae’s working procedures ensure that documentation is produced as we go, not later. Infrae offers training for its own products, and also provides general training in specific technologies.